Electrostatic shocks are being reported by many call centers' personnel. 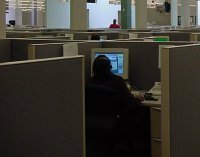 Personnel in Call Centers around the world report being shocked as they perform their jobs. These hocks typically are to the head area near the headsets they wear. Where else but call centers would one find several hundred people in an office environment tethered to a grounded telephone system by headsets? The phenomena are real and so are the effects on the personnel. The reported problems due to these shocks range from mild annoyance to loss of sight and hearing. Luckily the more drastic affects seem to be temporary.These are electrostatic shocks primarily of the person to the phone system. Typically the electrical or telecommunication systems are not to blame as the source of the electrostatic voltages which result in the painful shocks. Sometimes the source may be atmospheric in nature. Lightning in the general area may cause what experts call a "ground plane rise" and give a shock to persons wearing headsets. However, this is a more rare phenomenon if the system has proper surge protection. We investigated in several call centers the shocks caused by electrostatic charges accumulated on the personnel and discharged to other persons, the equipment or through the headsets. The primary causes of the electrostatic charge are personnel actions and clothing in relationship with the call center floors and chairs. In other words, the personnel themselves charge up their bodies because they wear clothes and shoes, which generate electrostatic charges when they scoot in and stand up from their chairs and when they walk on the floors. When this charge reaches enough potential (voltage) on the person to jump the gap between their ear and the headset, a shock occurs. Most headsets have some sort of insulative piece that cushions the ear to the headset speaker. The distance of this will hold off and arc of approximately 20,000 to 35,000 volts on the person. This means that by the time the electrostatic potential is great enough to jump, it is sufficient to cause physical pain. Most call centers have normal office style chairs, which have no antistatic capabilities. Also most call centers have normal carpeted floors with carpet that has little ability to keep static charges down against many shoe types. When a carpet is sold as "antistatic", it means that it has been tested at 20% RH against a standard Neolite sole sandal and found to be below 3,000 volts. This does not guarantee that the voltages on a person at any other humidity or wearing any other shoe will be less than 3,000 volts. In fact many shoes tested against "antistatic" carpets have much higher results. Most people can not feel below 3,500 volts when they discharge from their fingers such as getting out of a car or walking across a carpeted floor and touching a doorknob. However, when such a discharge is allowed to occur at the ear lobe area, the sensitivity is much greater. Better carpet from an antistatic point of view is needed when personnel are wearing telephone headsets. The application of antistatic chemicals to standard "antistatic" carpet will keep personnel voltages down but it is a temporary fix that must be reapplied every few months. The best carpet for the reduction of charges is conductive. This means that the carpet is made with conductive fibers allowing it to discharge static charges from the shoes of personnel. Our labs have tested carpets in very low humidities with insulative shoes and found that they provide a very low static generation for call center environments. Personnel add considerably to their electrostatic charging by the shoes they wear. Leather soled shoes are usually better than shoes with rubber soles. However, when conductive carpet is used with conductive footwear such as heel grounders or ESD shoes, the voltage on a person is kept below 100 volts. When most normal shoes are worn, conductive carpets generally keep the voltage on personnel below 1,500 volts which is well below the perception of pain during a discharge. 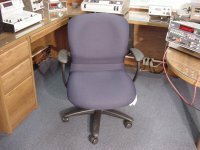 Normal office style chairs have polyester upholstery and have no means of grounding the chair. In the electronics industry where computer chips may be sensitive to a few volts, the chairs are conductive and have grounding mechanisms. In normal office chairs, when a person sits in and scoots around in the chair then stands up, they accumulate a significant electrostatic charge which may then discharge through the telephone headset or to another worker. If that other worker just stood up from their chair and walked over on non-conductive carpeting, the potential difference or the total voltage between the two people may double because the voltages may add. In this case the shock would also be doubled in intensity and also may cause two people discomfort. In call centers conductive chairs should be used. These chairs are usually very expensive and by the time the problem is known the call center usually has already purchased several hundred chairs. One alternative to buying a conductive chair is to use a conductive cover, which has conductive threads woven into it. Our lab tested conductive covers and found that they keep the voltages on persons below about 1/5th that of the plain chair. Of course the clothes that a person wears are very important to how much electrostatic charges are generated by the person. Oddly enough, cotton clothes, which are normally very good from an electrostatic point of view, may charge more against a polyester upholstered chair than blended fabrics. One method of keeping the voltage due to clothing on a person down is to require the personnel to wear conductive lab coats. This in combination with the chairs would disallow the kind of potentials now experienced in the call centers. the problem should go away painlessly.